Single use-chopsticks are a notable waste issue in China – roughly 100 trees a day must be felled to create the little, wooden eating utensils. In response to the atrocities being subjected to these innocent trees, the China Environmental Protection Foundation has assembled the ghostly remains of meals past into a full-sized chopstick tree. An impressive sculpture standing beautiful and tall, this was actually far from the message they hoped to convey. So what did they do to get their point across? They broke it and handed out reusable chopstick sets and statistics near the slain tree. 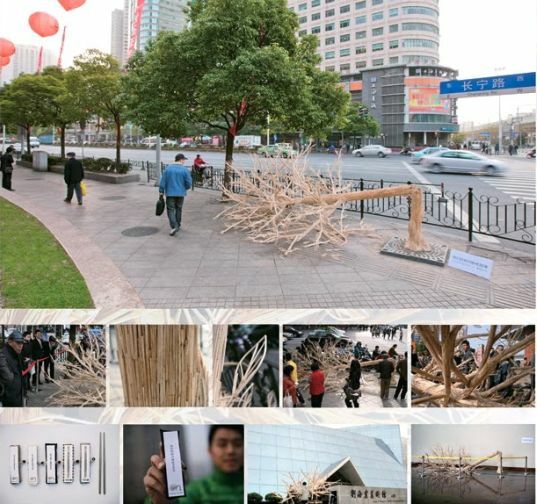 The tree was built from 30,000 used wooden chopsticks, stretched five meters high. 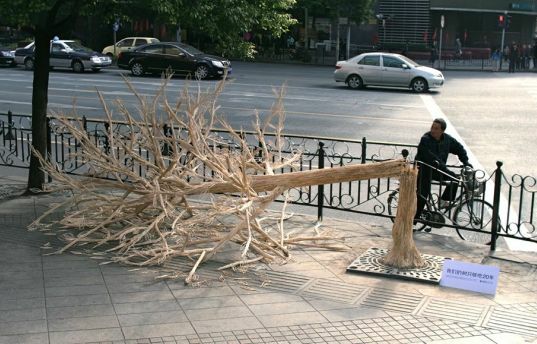 It stood along a local street in Shanghai accompanied by a laundry list of chopstick consumption statistics. And despite the likelihood they were dipped numerous times in soy sauce, the sticks were odor-free having been thoroughly cleansed before assembly. The hope of this project was to raise awareness and encourage the use of reusable chopsticks. China’s activists estimate that the country’s current forest stock will only support chopstick production for the next 20 years. What about all the plastic forks and spoons thrown out everyday in other countries? Trees will grow again, when oil is used for a product it is never oil again. actually i think it's 100 trees. This one small tree made of the chopsticks contains 30,000 chopsticks. 100 regular sized trees per day could probably produce between 5,000,000-10,000,000 chopsticks. that's a reasonable number for one day. there's metal unscrew-in-half ones . I think the correct number was 100 acres of trees, not 100 trees. 100 trees would not be that much in a country as big as China. Single use-chopsticks are a notable waste issue in China - roughly 100 trees a day must be felled to create the little, wooden eating utensils. In response to the atrocities being subjected to these innocent trees, the China Environmental Protection Foundation has assembled the ghostly remains of meals past into a full-sized chopstick tree. An impressive sculpture standing beautiful and tall, this was actually far from the message they hoped to convey. So what did they do to get their point across? They broke it and handed out reusable chopstick sets and statistics near the slain tree.